It’s really funny. When I tell my friends that Bill and I sleep on a King… they almost can’t believe it! 99% of my friends have King sized mattresses. I don’t know WHY we didn’t start with a King. I’m pretty sure it was because we got married SO YOUNG and had NO MONEY at the time. A queen was cheaper and a lot bigger than the futon I was sleeping on back home! A queen mattress was like an penthouse apartment for me!.Bill too. He was coming off a sofa bed! 11+ years later – it’s time for an upgrade. We are so ready for more room and more comfort and more… support! If Bill watches television for a little longer than me, it’s a guarantee that he’s going to wake me up when he comes to bed. As soon as he starts moving around, I always feel like an earthquake is happening. So, we’re moving onto bigger and better things – a Serta iComfort! I just had my consultation yesterday and next week Bill and I are going to go and test out our suggested find. I will take pictures of everything once we are there. I’m super excited!!!!!!!!!!!!!! Looking for a little sheep fun? 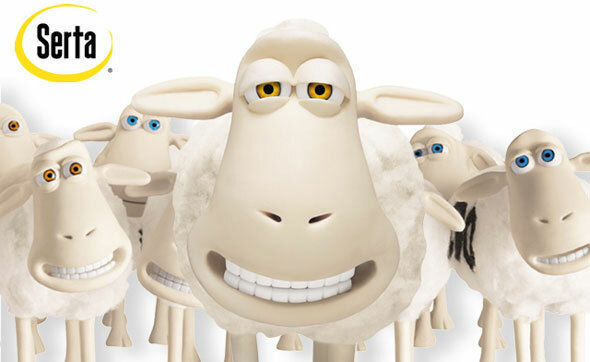 Serta is having a fun contest right now that I wanted to share. Head on over to Serta’s Facebook page to check out their mystery contest. Can you solve the case of the “Grest Serta Mattress Heist”? LOL! THe name alone is hilarious. By playing you have a chance at weekly prizes, including plush Serta Sheep, Serta pillows and other tokens of comfort.